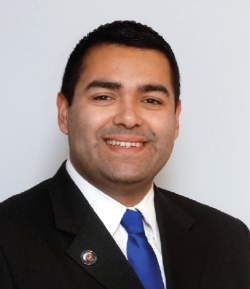 Freeholder Sergio Granados, a native of Elizabeth, was re-elected to his second term in 2016. In 2013, he became the youngest Freeholder ever elected to the board & youngest Democratic Freeholder elected in NJ. As Chairman of the Board in 2018, Granados announced “Moving UNION COUNTY Forward” initiatives to promote advocacy and equality, volunteerism, public safety, and the environment. As part of these initiatives, Granados spearheaded the opening of several offices within Union County Administration. The Office of LGBTQ Services, the Office for People with Special Needs as well as the Office of Community Engagement & Diversity were formed in 2018 and each of these new offices was the first of its kind in the State. Granados also created the first Union County Hispanic Heritage Month Celebration in October 2018. Granados has previously served as Chairman of the Open Space Trust Fund, working to create the Kids Dig In! School garden grants program. Granados paved the way for the first inclusive playground in Union County in 2017. He launched “Level the Playing Field,” a new grant program that supports creation of inclusive playgrounds, working to make Union County the first in the Country with an inclusive playground in every municipality. He also developed the UC Night at the Theater grant, to support efforts to provide education & enjoyment through the arts for high schools. Under his tenure as Chairman in 2018, Union County became the first county in the State to have police equipped with body worn cameras in all municipalities. In 2018 he helped to create the Warinanco Dog Park, the first in the eastern part of the County. As a past member of the Fiscal Committee, Granados contributed to efforts that led to the County achieving a “Aaa” bond rating from Moody’s—the highest attainable rating. In 2018, through an Ad-Hoc committee he created, they worked to further realize cost savings & efficiency methods that led to the lowest tax increase in 10 years. In 2018, Granados was honored for his achievements in community service by both the United Way & Jewish Family Services. Granados has previously been honored as Man of the Year by agencies such as Community Access Unlimited, the Urban League of Union County Young Professionals, the Lions Club International, the Boy Scouts of America & the South Asian Community Outreach. Granados attended Union County College, and graduated from Kean University with a Bachelors in Business Management and Masters in Public Administration.